Despite the name "Japanese," the breed originated from China and were given as gifts to the emperor of Japan. 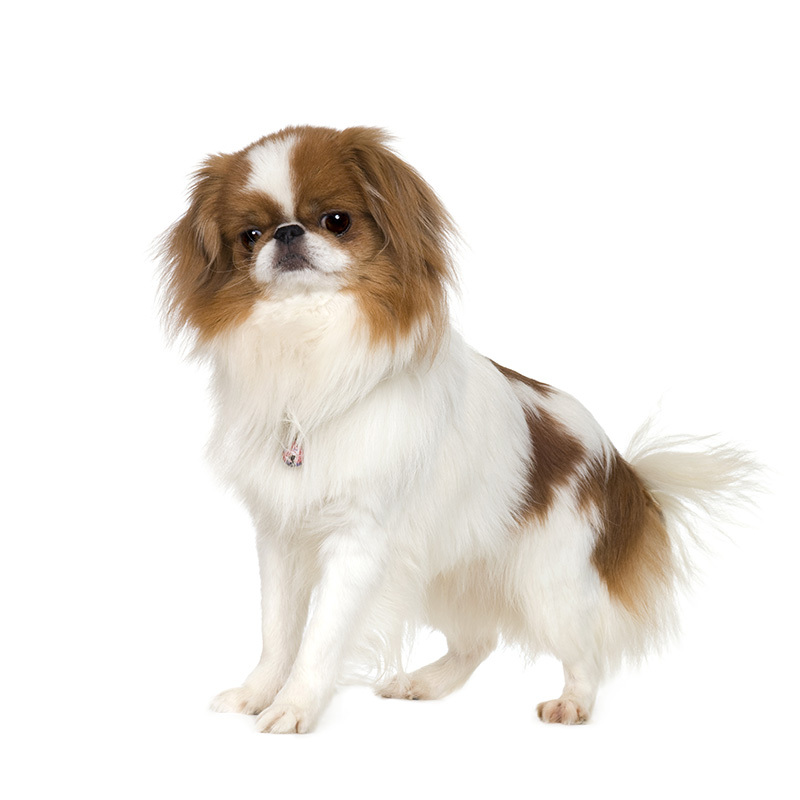 They were originally called Japanese Spaniel, and their name was changed to Japanese Chin in 1977. In Japan, the Chin was regarded as a seperate being (chin) and not as a dog (inu). They were probably crossed with small spaniel-type dogs to achieve the look they have today. Commodore Matthew Perry introduced Japan to international trade in 1853 and imported the Japanese Chin to Britain and the United States. Perry's daughter, Caroline Perry Belmont, owned a Chin, as well as President Franklin Pierce, and the Secretary-of-War at the time Jefferson Davis. The Japanese Chin is first and foremost bred as a companion dog. They are pleasant, loving, intelligent, and extremely devoted to their master. They can be so sensitive to their environments that they are known to shape their personalities around them; in fact, they are so devoted to their families that they can suffer from separation anxiety if left alone for long periods of time. They are very charming little dogs with a happy and lively disposition. Japanese Chins are catlike in many ways. They are known to groom themselves by licking their paws and wiping their head, and to perch themselves on the back of couches. They only require a small amount of exercise compared to other breeds and can often get their exercise by running around the house, going for daily walks, or by playing in the yard. Japanese Chins are so easygoing, loyal, and full of life that they make the ideal companion. Japanese Chins usually weigh between 4 to 15 pounds and stand approximately 7 to 11 inches tall. They are a small dog, and are known for their tail that is carried high and arches over their backs. Their color is usually white with colored patches. They will require weekly grooming. Due to their flat faces, Japanese Chins will often snort or sniffle. Sometimes they reverse sneeze; gently stroking their neck seems to help. They also don't handle the heat very well, so they are definitely inside dogs. There are some Chin owners who say their dogs like to "sing" and will chatter to announce the arrival of guests.